Many of us feel like we simply don’t have enough time to get everything done…and one of these things we struggle to fit in each day is prayer. We want to live a good and holy Catholic life, and raise a good and holy catholic family, but there just isn’t enough time! And I get it, especially while raising babies, life is very full! 1. The CORRECT order of priorities you should live your life by. 2. How creating a daily schedule can be life-changing. 3. That you need to make sure your own needs are met BEFORE you can go out and effectively meet the needs of your family. To help you with this work (and it is on-going work, even for those of us that have been at it for awhile!!!) I have 2 resources I would like to offer you. This simple little book offers you space to plan out and live your life based on the priorities we discussed in this video. I use my daily docket every day, and it has transformed my life! 2. RECLAIM THE DAY EMAIL COURSE FOR CATHOLIC MOMS. Want a little more help getting your life in order? Please consider signing up for a free email course. Over 7 days I will walk you through all of this information and give you ideas for putting it into practice. As Catholic Parents we have the honor and obligation to pass the faith along to our children. But, this can be hard and tricky work. Our children are well, children, and many of us are imperfect and were imperfectly formed in our own faith. However, God made you a Catholic Parent, and therefore you need to really fight for your own faith and the faith of your children. This video is the first in a series of videos that will help you understand how you can be an effective teacher of the Catholic Faith. 3. Trying your best to teach. KEEP SCROLLING TO WATCH ALL OF THE VIDEOS! They are a series and were created to be watched together. The first key to teaching you children the #catholicfaith is to remain grounded in and sustained by PRAYER. That’s right, before teaching the children in your life the Catholic Faith you need to work on YOU first and make sure that you are connected to God. As Catholic Parents our first work is to create a DAILY, DEDICATED prayer time for ourselves. I hear from Catholic Parents ALL THE TIME that they just don’t have 10 minutes a day to use for prayer. In fact, I used to feel this way myself, but you do have time to pray, you just aren’t making prayer a priority…but you need to do this! If you are frustrated that you don’t have time to pray during this busy time of raising Catholic Kids, please consider taking this FREE 7 day email course for Catholic Parents. It is called RECLAIM THE DAY, because once your priorities are in order you WILL be able to live better and find time to pray. Join here: https://catholicsprouts.com/reclaim-the-day. The 2nd Key to teaching the #catholicfaith is to have a profound level of trust in God. Yes, don’t dive into lessons plans and Pinterest crafts yet! Effectively teaching the Catholic faith must first be grounded in faith. 1. In order to be a good teacher of the faith, you need to be a trusting believer. —Do you trust all that the church professes to be true? Even the things that you might not understand. —Do you trust that God cares specifically about you? —Do you trust that God is real and alive and active in the world today? 2. God has chosen you for the vocation of Motherhood, and charged you with the task of teaching the faith. God does not inspire us to do things that we won’t be able to achieve. Through His help we need to trust that we will be able to teach our children the faith. 3. Progress in this work will be slow and frustrating. —Faith that God can bless your small efforts. The 3rd Key to teaching your children the #catholicfaith is to TRY! That’s right, in this video we will finally talk about what we can DO to actually teach…but we are going to TRY our very best…and know that whether our work is fruitful is completely up to God. 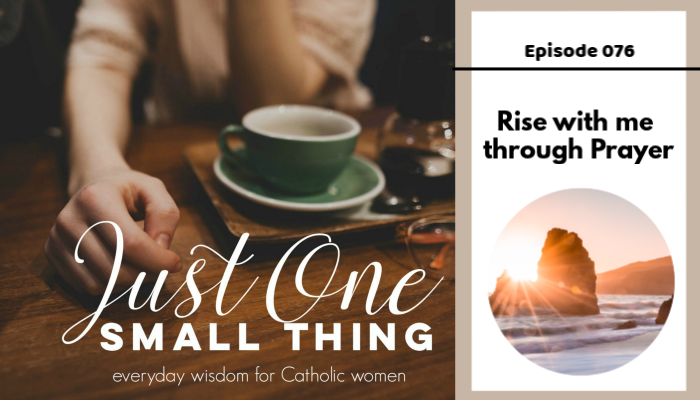 ex: Turn off the TV, make room for silence, Make a habit of discussing the readings/homilies, Direct your conversations toward God, and Provide Catholic Activities the Kids can reach for on their own.